Addison's disease, the common name for hypoadrenocorticism or adrenal insufficiency, as I have discussed in my last two blog posts, is a disease with vague clinical features that are common in many other ailments, making diagnosis difficult in many cases. But once Addison's disease is correctly diagnosed, a properly treated dog can live a normal and happy active life. The adrenal, one on each kidney, is made up of two layers, the cortex and the medulla. The inner medulla secretes epinephrine (adrenaline) and is not affected by Addison's disease. The outer cortex layer secretes two corticosteroid hormones, cortisol and aldosterone, both of which are deficient in Addison's disease. Aldosterone is a corticosteroid hormone (more specifically, a mineralocorticoid — think minerals: salt, sodium, potassium) responsible for maintaining normal circulating electrolyte levels. Once secreted, aldosterone acts on the kidney to conserve sodium, excrete potassium, and retain needed water. Cortisol is also a corticosteroid hormone (in this case, a glucocorticoid — think glucose, sugar, energy) that is essential for life. It supports a variety of important cardiovascular, metabolic, immunologic, and stress functions. There are three forms of hypoadrenocorticism: primary, secondary and atypical Addison's disease. Primary Addison's disease is most commonly is the result of immune-mediated damage to the glands. Atypical Addison's disease is a poorly understood disorder, thought to generally be an early stage of primary Addison's disease. Secondary hypoadrenocorticism results from a deficiency of the pituitary hormone, adrenocorticotropic hormone (ACTH). Without circulating ACTH, cortisol cannot be secreted by the adrenal glands. It is important which form of hypoadrenocorticism is present in order to provide the correct treatment. In primary hypoadrenocorticism, both cortisol and aldosterone are deficiency and must be replaced for life. In atypical and secondary hypoadrenocorticism, on the other hand, only the glucocorticoids need to be replaced, at least initially. Untreated, hypoadrenocorticism (especially primary Addison's disease) can lead to an adrenal crisis. An adrenal crisis is a medical emergency that requires intravenous fluids and glucocorticoids to restore the body’s levels of fluids, salt, and sugar to normal. Once stabilized, the dog can then be treated with glucocorticoid and mineralocorticoid replacement therapy at home. Depending of the subtype of hypoadrenocorticism, synthetic corticosteroid drugs that act like mineralocorticoid or glucocorticoids used for hormone replacement therapy. For mineralocorticoid (aldosterone) replacement, either an oral medication called fludrocortisone acetate (Florinef™) or the injectable desoxycorticosterone pivalate (DOCP; Percorten-V™) is used. We typically institute treatment with DOCP (Percorten-V) at a dosage of 2.2 mg/kg, subcutaneously or intramuscularly, every 25 to 30 days. Side effects associated with DOCP therapy are rare. This dosage interval is effective in almost all dogs, and most are well controlled with a DOCP injection every 4 weeks. Initially, serum kidney and electrolyte concentrations should be monitored at approximately 2-weeks intervals in order to determine the drug’s peak effect and to help make necessary dosage adjustments. Once stabilized, serum electrolyte and creatinine concentrations are checked every 3 to 6 months. Because DOCP is a pure mineralocorticoid and has no glucocorticoid activity, it is essential that dogs receive concurrent glucocorticoid supplementation (see below). Fludrocortisone is a synthetic corticosteroid that possesses moderate glucocorticoid activity as well as having marked mineralocorticoid potency. By comparison, fludrocortisone has 10 times the glucocorticoid activity and 125 times the mineralocorticoid activity of cortisol. In this regard, fludrocortisone is very different than DOCP, which possess no glucocorticoid activity. If fludrocortisone acetate is employed as mineralocorticoid supplementation, we recommend an initial oral dosage of approximately 0.02 mg/kg/day. After initiation of fludrocortisone therapy, serum electrolyte and creatinine concentration should be monitored weekly, with the dosage adjusted by 0.05-0.1 mg/day increments until values have stabilized within the reference range. Once this is achieved, the dogs should be reevaluated monthly for the first 3 to 6 months of therapy, then every 3 to 6 months thereafter. For dogs that have atypical or secondary Addison’s, mineralocorticoid replacement therapy with DOCP or fludrocortisone aren't needed because the production of aldosterone isn’t effected and the serum electrolytes remain in balance. In addition to replacing deficient mineralocorticoids in dogs with Addison's disease, the missing glucocorticoids must also be replaced. This is typically done with an oral form of the synthetic glucocorticoids prednisone, prednisolone, or hydrocortisone. With atypical Addison's and secondary forms of hypoadrenocorticism, glucocorticoid replacement is all that is needed, at least initially, since these dogs do not have serum electrolyte abnormalities. The correct dose of the supplemented glucocorticoids, such as prednisone, cannot be measured with a blood test. Rather it's determined by your observations: the lowest dose that keeps your dog symptom free, happy and eating! The most common side effect of overdosage is an increase in thirst and urination, which can be intense in some dogs. With proper treatment, the long-term prognosis is excellent. While your dog with Addison’s disease will need medications and monitoring for the rest of his life, most dogs with Addison’s can return to their favorite activities. You will help your dog lead a normal, active and fun-filled life. My dog was recently diagnosed with Addison's disease and is about to start DOCP therapy. He is acting great, but has some serious atrophy of the muscles of his face, temples, and neck, and is having some trouble staying hydrated. Can I expect these signs to improve once he starts DOCP, or is there a dietary change I need to make? Yes, you can expect the signs of Addison's disease to improve after mineralocorticoid supplementation with Percorten-V (DOCP). The hydration should improve, as well as the appetite and general well-being. The atrophy of the muscles of the face and temples may or may not be related to Addison's disease. These dogs lose weight but generally do not have severe temporal muscle atrophy. It may be that your dog has a primary muscle disorder, such as myositis, which is an inflammatory condition of the muscle. If you do not see any improvement in the muscle after a few weeks of Percorten-V treatment, talk to your veterinarian about further diagnostics that could be done to help better diagnose the muscle problem. I've got a patient 8yo FN WHWT, 12.5kg who was diagnosed with addisons in 2007. She had been stable on 0.3mg Florinef until this summer. Although she is totally fine clinically her electrolytes are not well controlled. Initially her K was 6.2 and Na/k 22.69. So her florinef was increased to 0.4mg sid. After 2 weeks on that dose her K was 6.3 and Na/K 22.62. She has now been on 0.5mg florinef sid for 2 weeks and her values are K 5.9 and Na/K 24.59. All the texts I've read report using much lower doses than this. Is it wise to increase her florinef dose further or since she is clinically well should we leave her where she is? What is your opinion of low dose Percorten V therapy? I belong to a yahoo group for Addison dog owners that is touting it based on a paper of Dr. Julia Bates. My dog has been doing fine on the higher dose or normal DOCP [for 8 years-he is 11], but being of the school of thought and practice that less is better I am interested in your thoughts. My vet Dr. Pam Drake [New Frontier Animal Clinic] referred me to your blog and expertise. I generally start with the label dosage (2.2 mg/kg q 25-30 days). If the serum electrolytes remain normal, I'll start to decrease the monthly dosage. Many dogs can get by on 1.5 mg/kg/month, and some will be fine on even lower doses (1.0 mg/kg/mo). I'm not familiar with Dr. Bates or her work on Addison's disease so I'm not sure how my experience compares to hers. I do know, however, that Percorten is a very safe drug and it's not harmful to give a bit more than may be absolutely necessary. I am also a member of the yahoo group that advocates the low dosage Percorten. We have been slowly reducing my 85 lb., 18-month old Lab puppy (diagnosed in November) from a starting dosage of 80 mg. He is currently at 75 mg and, at this dosage, his NA/K ratio is 40 with his K at 3.9 (3.6-5.5) and his NA at 152 (139-154). The group says that Addison’s dogs feel best when their potassium is at the mid- to high range of normal. Do you agree with this? How will we know when not to reduce any further? If you go too low on the dose, the potassium will rise to above normal, the sodium may fall, and a dog may not be doing as well clinically. So we based dose adjustments on both lab findings and clinical signs. But you must continue to monitor the serum electrolytes during the taper to make sure that you aren't overdoing it. Prednisone which has been reduced to 2.5mg every other day. He has lost muscle mass in the head such as the 2011 post but did so after the treatments started. He has also lost almost all the hair on his legs, chest and stomach. These symptoms prompted the reduction in the Prednisone. The hair on his back has become very coarse and long. These conditions continue even with the reduction in the Prednisone. His electrolytes have also been retested and were ok. We live in a very rural area of Arkansas so any suggestions you might have would be deeply appreciated. How much does your dog weigh? Dosage of Florinef? It sounds like the current prednisone dose is reasonable -- the original dose was much too high. Has a serum thyroid panel been checked? It's not uncommon for Addison's dogs to develop concurrent hypothyroidism (both are autoimmune diseases). One Fludrocortisone Acetate 0.5mg morning and night. He is a big pointer and weighs 65lb. As far as the serum thyroid panel, I do not remember and my vet is on vacation until July 22. Thank you very much for your reply. 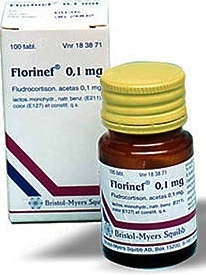 Florinef contains primarily mineralocorticoid activity (needed to normalize the serum sodium and potassium) but this drug also contains some glucocorticoid (prednisone-like) activity. By giving 10 tablets a day, you might not need to give ANY prednisone! Is the thirst normal? If it's increased, I would try stopping the prednisone. When your vet returns, talk to them about the thyroid testing, and let me know. Good Luck! I guess you meant .10mg a day. And yes, I will ask. Thank you very much. Now I'm confused. If you are giving trade-name Florinef, the tablets are 0.1 mg tabs, so if you are giving 0.5 mg twice a day, that would be 5 tablets twice a day. Are you having the Florinef compounded into 0.5 mg tabs? What are you giving exactly? So you are giving 1.0 mg of Florinef a day, which is a high dose. Again, this is contributing a significant amount to your dog's glucocorticoid needs. Thank you for your help. His serum thyroid was tested and he was very low. He is now on medicine for this and his hair has started returning. I will recheck the amounts of his medication. Again I cannot thank you enough. I also have an English pointer, she has Atypical Addison's and is on 1.5 mg/day prednisone. She does not show any symptoms of too much prednisone, however she has hair loss on her chest, stomach, and legs like described in the post above. I assumed it was due to the prednisone treatments, is it possible it is something else that could be treated? Thanks for your help! Some dogs will lose hair secondary to too much prednisone, but 1.5 mg/day is a small dosage. I'd talk to your vet about other causes of alopecia (hair loss). If they haven't done the tests for hypothyroidism, I would consider running those tests. My 2 1/2 yr old collie cross was diagnosed with Addison's disease in April, He takes 0.1mg florinef x3 per day, the last few day iv noticed him shaking again (not really done that since he was ill, just before been diagnosed) and at times he seems to lose power/ muscle loss in his front leg, I'm just wondering is this normal in Addison dogs from time to time? Dogs with Addison's disease, like all normal dogs, will have a "bad day" from time to time. Once stabilized, as long as your dog is eating and not vomiting, mild shaking for a day or two is probably of little concern. However, if it is severe or persists, then the medicine needs to be adjusted. Are you giving any glucocorticoid supplementation or only the Florinef? If you aren't giving any prednisone, a dose of 0.1 mg/kg/day is recommended. Have you rechecked the serum electrolytes? The dose of the Florinef might need to be increased. Hi Dr.Peterson think you for your reply, He is also getting Predicare 5mg x1 once a day. Do you think the slight loss of power in his front leg (this is only for time to time for a minute or two) would be down to needing to up the Florinef? It could indicate a need for more florinef or it could be the result of too much prednisone. Sounds like you need some blood work and you need to speak to your vet. My 6 yr old JRT cross developed Addisons 30 months ago. He is stable on 2.5 Florinef tablets morning & evening, so a total of 0.5mg daily. His last ratio - K/Na was within normal limits. He weighs 12kg. He occasionally needs the odd prednisolone (1mg). Over past few weeks he has become very lethargic, feels the cold, won't go for walks, very itchy -but nil to see. I got his electrolytes checked and as I said they were ok. Could he have an under active thyroid gland. I have vet appnt on Friday? Which thyroid tests dod you recommend in the first instance? Very grateful for your opinion. Dogs with Addison's disease are predisposed to developing other autoimmune endocrine deficiency diseases. So the combination of Addison's disease and hypothyroidism is not uncommon in dogs. I'd recommend a complete serum thyroid panel, including a total and free T4, TSH, and thyroglobulin autoantibody test. If possible, I'd send the panel off to the diagnostic endocrine lab at Michigan State University. Unfortunately I'm in the UK. Thanks you for this wonderful service, you are a star. I'll keep you posted. My boy is 10yrs old and was diagnosed with Addison's 6 or 7 years ago. He does well on Percorten every 4 wks and prednisone (alternate 5mg and 2.5mg daily. Yesterday he got acute blindness. We were able to drive a few hours and get him to NC State Vet school. The ophthalmologists prescribed 15mg prednisone 2x daily along with topical steroidal anti inflammatories. My question. will the 30mg oral prednisone over 2 weeks be a problem because of his addison's? Oh he also takes thyroxine daily. Treating optic neuritis (I'm assuming that is the likely diagnosis) with large doses of glucocorticoids for a short period isn't going to make the Addison's disease go out of control. We just don't like to give such high doses chronically because of the side effects (increased thirst and other signs of iatrogenic Cushing's disease). Right now, you have to treat the more pressing problem, and that is the blindness. Good luck - I hope that your dog's vision improves! My daughter's 6lb dog was recently diagnosed with Addison's. She had one Percorten injection - blood work follow=up was fine. She gets .5 Prednisone. She acts fine but has been having diarrhea for 2 days. The Vet said to give Pepcid - and give her higher dose of Prednisone. I want to keep her on a low dose. Any help you can give me would be greatly appreciated. In my opinion, your dog is on plenty of pred. I wouldn't raise it, I'm not even sure if the diarrhea is really being caused by the Addisons' - most of these dogs also have a poor appetite with vomiting when they have vomiting. I'd wait a bit more, check a stool sample, try a diet change, etc. I'm not sure why pepsid would help diarrhea (it's an antiacid), but I am NOT a GI expert. Thank you, Dr.Peterson. Do you generally recomend a dog taking steroids i.e. Prednison - also take Pepsid to help prevent gastric issues. Sorry, the Vet said Pepsid was for that not diaharrea as I mentioned. Should I give a little Pumpkin for the diaharrea. Thank you so much. No, with the low doses of pred used for Addison's disease, I've never found it necessary to use concurrent antacids. I doubt if the pumpkin will effect the serum electrolytes but your vet should be monitoring these levels anyway. Don't worry about the Percorten-V. It will be good for months. If your dog is well regulated and doing well, it shouldn't be a problem. Talk to your veterinarian about this, however. My daughter's, 4yr old, 6 1/2 lb poodle has Addison Disease. She takes .4mg of Prednison and a monthly injection of Percorten. She gets very stressed going to the groomer. Would it be okay to give her 1mg Prednison that day, or is that too much? What would be the safest dosage to give her at times when she is stressed. Thank you so much. Giving 1 mg of the pred on that day should be very safe - no problem at all. I have a 2 1/2 yr old German Shepherd with Addisons. We are currently on 2.5 mg of prednisone 2x/day and .5mg of flourinef 2x/day. When he had his original ultrasound 4 months ago they had to shave part of his belly and leg and the hair still has not grown back. Is it ever going to grow back? And if so is there anything I can do to help? Depends on the cause. Could be due to too much glucocorticoid or your dog would be hypothyroid. Talk to your vet. I have a Great Dane with Addisons, she gets fludrocortisone ( two 0.7mg in the morning and two in the evening). She was diagnosed with hypothyroidism in July, and prescribed soloxine 0.8 mg, one tablet twice a day. When she started the soloxine in July, she weighed 211 pounds. After 2 months of the soloxine, she weighs 234 pounds. Do you have any feedback or recommendations. ( I do give her prednisone on very rare occasions, at 1/4 th the normal dose, only for stressful situations. You are giving 1.4 mg of florinef twice a day? 2.8 mg per day? If so, that is the largest dose I've ever heard of.. is the thirst and urination excessive? Have the serum electrolytes been checked recently? My 12lb 1.5 year old shih tzu mix was diagnosed with Addison's four days ago. She got an injection of .46 percorten and has been on .5mg of dexamthasone daily since her crisis. The last few days she has periods of shaking. They seem to get better when she eats. What is causing this? And is it normal? My 12lb 1.5 year old shih tzu mix was diagnosed with Addison's four days ago. She got an injection of .46 percorten and has been taking .5mg dexamethasone daily since her crisis last week. She's mostly back to normal, but has periods of shaking that seems to get a bit better after eating. What is causing this, and is it normal? No, it's not normal, but we see these signs occasionally in recently diagnosed dogs. Observe closely, and the signs should improve over the next few days. If not, talk to your vet! Her Na/K+ was a little off, so he bumped up her florinef to 0.2mg bid and kept her pred at 2.5mg daily. We had hoped to decrease her pred dose as she's having significant polyuria. 1. Is there any reason to be checking cortisol levels since we already have the diagnosis (confirmed with ACTH test)? 2. Am I correct that you can't use cortisol levels to determine effectiveness of the prednisone? You are correct on both counts. There is no reason to ever measure cortisol again, since you can't use it to dose the prednisone. Many dogs get treated with very large doses of steroids at time of diagnosis. This will result in severe polyuria and polydipsia that can take weeks to resolve. If the increased thirst continues for another month, then I'd try lowering the dose of the prednisone. Florinef does have glucocorticoids properties so you might not need to give any predisone to your dog. This has to be determined with trial and error, based on your dog's activity and appetite. My 4yr old male 16lb pomeranian has been battling Addison for a yr. We have been back and forth with changing medications due to vomting, nausea, and lethargic. Initial ACTH showed <0.7 on 3/14 with a Na 126 and K 5.8. Treatment with Florinef .2 mg daily resulted in Na 145 and K 5. On 6/14, symptoms included nausea started on 2.5 mg Pepcid ac with a Na 139 and K 5.1 resulted in treatment 1.25 mg predisone daily. On 8/14, predisone increase to x2 day due to lethargic resulted in Na 148 and K 4.5. Now off predisone due to side effects, Na 139 and K 4.7. Florinef was increased to 0.25 mg daily because of low Na. Recent hair loss and increase thirst has occured. Are we on too high of a Florinef dose? Should I consider DOCP treatment?Should we test for other diseases ? You need to speak to your vet about how certain they are about the diagnosis. Dogs treated for Addison's generally show a good to excellent response. DOCP may work better with less glucocorticoid side effects. Again, you need to speak to your vet and maybe see a internal medicine specialist. My dog has Addison's disease. She is getting a monthly injection of Percorten-V and her Prednisone pill once a day. Soon she will be due to receive her yearly injections. Is this safe being she has Addison's. I worry about any side effects. Yes, replacement doses of these hormones is safe. Without the treatment, Addison's disease is a fatal disease, so the alternative (no treating) is certainly not an option. I was not clear on my last post. I wanted to ask, being she has Addison's. is it safe for her to have her annual booster vaccinations for rabies, lime, etc. which she will be due to receive this year. Thank you so much. Yes, the annual booster vaccines should be fine. My 2 yr old boston terrier was diagnosed with addisons last week after her first addisonian crisis. She was given a shot of DOCP and is taking 2.5mg of Prednisone every 12 hours (she weighs 27 lbs). Being a boston terrier she has LOTS of energy & has always had major separation anxiety issues which has led us to crating her anytime we leave her home alone (never more than 4-5 hours). My question is first do you have any recommendations on how we can manage crating her with separation anxiety teamed up with Addisons? Also, we are on day 5 of her taking the 2.5mg of prednisone every 12 hours & she seems to have lots of shakes. She starts shaking primarily when she gets excited or sad (which both seem to be quite often). Is this a side effect of the high level of prednisone & will it get better? Your dog is on a good dose of prednisolone. It's too early to expect all of the signs to completely resolve. No association between Addison's and separation issues. You will have to talk to your vet about that. My dog is 85 lbs and is on 2.5 ml of Percorten and .625 daily of Prednisone. We are going to start reducing the Percorten on his next injection. Does the Percoten cause more shedding than normal-we seem to have an abundance of fur and it's not even Spring yet. Percorten does not cause shedding. Prednisolone can but your dog is on a very low dose. Most likely, the shedding is related to being sick from Addison's, especially if the diagnosis was recent and the treatment has not been given for long. We will be switching from florinef to percorten. 1. Do we continue the florinef for anytime after the percorten has started? I generally continue the florinef for 2-3 days after giving the first Percorten injection, then stop the pills. I continue the pred at the dose of 0.1-0.2 mg/kg/day, and adjust as needed based on clinical signs. Talk to your vet about all of these doses too. My one year old chocolate lab was recently diagnosed with Addisons, he's 26kg and has had his florinef increased gradually from 0.3mg twice daily up to 0.5mg twice daily , along with 1mg prednisone daily. Whilst he is well in himself his electrolyte levels and kidney function readings are not improving with the increased medication, last week it had worsened. 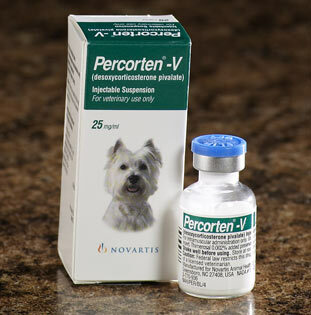 The vet is now looking to percoten as an alternative though as we are in the UK it is not readily available. He has said he may increase the florinef further which caused me some concern. My last dog also had Addisons and lived for 15 years on 0.2mg twice daily, I know all dogs are different but is there a chance that his florinef dosage could be too high? Some dogs need a very high dose of Florinef to control the disease. That's not a problem in itself, although many develop PU/PD because of the glucocorticoid activity of the Florinef. We may be able to stop the pred in this dog, given the high Florinef dose now being administered. For a Golden Doodle, giving 5 mg per day of the pred is already a relatively high dose for Addison's. You can certainly double the dose as needed for a few days if need be, knowing that iatrogenic Cushing's may result. Why are they taking this dog on long-distance trips if it makes the dog so sick? I'd also continue to do other investigations into the diarrhea. Most dogs with Addison's have many other signs and diarrhea is not the major sign. My dog was diagnosed September 2014 and we seemed to have the Addison's under control. Lately there's been issues. She's been shaking, and the vets solution was to increase her meds. She's now on .60ml of percorten every 28 days and 2.5mg of pred every other day. Her last shot was 11 days ago. She's been shaking/tremors for 4 days and started panting a lot today. She also drinks a lot, pees a lot, and seems restless. Eating fine. I'm afraid the vet is going to want to increase meds. Could her meds be too high? 14.5lb shih tzu mix. The thirst and urination could be due to too much pred but the shaking could be a sign of too little medication. Talk to your vet. My ten year old JRT was diagnosed with Addisons 2 years ago. She weighs 14.5#. She is on PercortinV injections every month. She is not on any prednisone. She seems to have a definite cycle during the month. After the injection for about two weeks she gets fluffier, the second two weeks she sheds like crazy. She is also PU/PD for from a few days to ten days in the middle of the month! We have been slowly decreasing the amount of PercortinV from 0.55 initially, she is now getting 0.45. Blood work shows values in normal ranges, except ALT was 873 last week. Will retest this week to recheck. Bile acids (two sample) was dead on normal. We actually did an ACTH this month because she was so PU/PD. Her Addisons is the result of an overdose of Trilostane (compounding pharmacy error) which seems to have permanently damaged her adrenals. What further testing would you reccomend? Our Juliette is 4yrs old. She has Addison's disease. She gets 1/2 ml of Prednisone daily and an injection of .25mg Percorten every 30 days. She was just to the vet and bloodwork and electrolytes were fine. She often gets bouts of diarrhea and takes Pedialyte for that. Is the medications she is taking too much or too little? She weighs 10 pounds. We worry about the diarrhea because it happens often. She eats Wellness mixed with a little Purina Mighty Dog soft food. Her vet. said when she has diarrhea to increase the Prednisone, yet I have read that Prednison can cause diarrhea. We worry about dehydration and getting lethargic. Any help you can give us would be greatly appreciated. Thank you so much. The maintenance dose of Prednisiolone for a 10 pound dog is around 0.5-1.0 mg per day. Most pred tablets come as a 5-mg size (the human maintenance dose), so 1/2 of that tablet is probably too much. If your dog's thirst is normal, then it may be okay. Diarrhea with a good appetite and no vomiting is unlikely to be caused by Addison's, especially when already on treatment for the disease. I'd concentrate on a further GI tract workup, rather than blaming the diarrhea on the Addison's. If the larger dose of pred helps the diarrhea, that could be working directly on the GI tract to help suppress inflammation and have nothing to do with cortisol deficiency. Talk to your vet, possibly for a referral to a gastroenterologist. I have a 15yo dachshund Kolbe who was diagnosed with Cushings in February. His initial ACTH numbers were 13.4 pre and 32.7 post. He did not have the classic symptoms but an abnormal ALP caused suspicion. Our vet wanted to treat because Kolbe had been suffering from corneal ulcers that would not heal. He thought the inability to heal may have been related to the Cushings. Kolbe weighed about 15 pounds and 30mg of Vetoryl was started 2/21. ACTH on 3/6 was 2.1 pre and 6.2 post and on 3/21 was 2.5 pre and 6.5 post. Vet was happy with these results and the 30mg dose was continued. On 4/9 Kolbe had a keratotomy to treat a stubborn corneal ulcer in his left eye. Within a day or two, he was shaking, shivering, loss of appetite, diarrhea, lack of coordination... He spent the night at a hospital 4/14. Neurological exam was normal, X-rays showed some disc narrowing (he has IVDD; ruptured 2 discs when he was 2yo, but no issues since), abdominal ultrasound normal. $2000 later we really didn't have any answers and they felt his symptoms were disc related. Sent us home with tramadol and crate rest. No signs of improvement over the next few days. Kolbe was due for another ACTH test 4/20 and the result was 1 pre and 0.9 post. We stopped the Vetoryl and started 1.25mg of prednisone daily. He's been on the prednisone for about 4 weeks, doing much better, but yesterday I noticed some skin changes along his spine and the vet diagnosed calcinosis cutis. We're tapering the prednisone over a week or so and will repeat an ACTH test to see where his cortisol levels are. What options do we have for treatment if he remains in an Addison state and we can't use prednisone because of the calcinosis? Most dogs that develop low cortisol values on trilostane do not develop Addison's disease or need long term prednisone. We normally do another ACTH stimulation test after 2-3 weeks off of the drug, so that's what I would recommend now (no pred for at least 24 hrs). Talk to your vet. Hello, Dr. Mark. Our 55lb Standard Poodle was diagnosed with AD about three years ago, at age 2. Initially was put on Florinef 0.1mg (2 tabs/twice daily) and Prednisone (1 tab every three days). He has done exceptionally well ever since, and has needed no vet care outside of usual maintenance. Over the years, we reduced his medication to 2.5 tabs daily (1.5 AM and 1 before bed) plus the Pred every three days, with no change whatsoever in his water consumption, output, energy, mobility. How accurately can medication dosage be monitored by our dog's behaviour alone (annual bloodwork only)? The medication is expensive, and I don't want to be giving him more than necessary if he doesn't need it. I also want to leave room for increasing dosages later in his life, if necessary. Thanks! Monitoring clinical signs is important, but you aren't going to pick up on serum electrolyte changes unless they are severe. Bloods should be monitored after every change in Florinef dosage and at least twice a year in my opinion. This is a serious and life threatening disease. You might find that having the Florinef compounded is cheaper than using the human product. My 3.5 yr old wheaten terrier was diagnosed with Addison's disease last Wednesday, and has been on the oral pill twice a day, as well as a pill for the diarrhea twice a day. Its now monday and he has pretty bad diarrhea still... he's acting 100 times better and eating and drinking so just wondering if that will get better or should I take him in again?? thanks. Can't say without knowing more about your dog. Talk to your vet(s) and ask them. The cost of Percorten in a small dog should not be that great. Most dogs can be managed with doses a bit lower than that recommended by the company (eg, 1-1.5 mg/kg instead of the label dose of 2.2 mg/kg). Talk to your vet about you giving the injections at home, which would likely save you much money. You could also talk to your vet about using genetic or compounded (oral) Florinef, which might be cheaper than the Percorten. My 5 year old GSHP weighs about 17 kgs and has been diagnosed for about a year after a bad crisis and has been on .3 of Florinef and alternating days of .125 and .25 of prednisone since diagnosis. She has been maintaining okay, but has gradually since winter had some serious muscle wasting, weakness, shakiness, refusal to eat, and mild lethargy. I took her in to see her vet about a 12 days ago and labs were "way out of whack" (he did not give me results). He increased pred to 5 mgs and Florinef to .4mg and return for labs in a couple of weeks. She perked up for about a week eating and running around and then went right back to her previous state of not eating and lethargy. After reading the comments on this site, I called the vet to ask if we could go up to .5mg on the Florinef and he said that he would rather not. He said she was at the upper range of the doseage for Florinef already. He just wanted to increase the Pred to 7.5mg a day instead and then draw labs. I have not been able to find an upper limit on Florinef dose anywhere. Do these changes seem appropriate? I am not sure of his expericence with Addisons because he always refers to referencing a book for her care. If Florinef can benefit both mineralcorticoid and glucocorticoid needs, why would they be so hesitant to increase Florinef. He also wants to recheck the ACTH when she is stable, but I am not sure of the point of that. My dog is just wasting away before my eyes and I am doing everything I can to help her. Thank you for any advice. You are correct. There is no upper dose limit for Florinef. No dog should get more than 5 mg of pred per day for long term control of Addison's (that's the human maintenance dose!). If you are sure of the diagnosis, we would never repeat the ACTH stimulation test to monitor. Sounds like to need another opinion and a specialist would be best. Would it hurt to give my dog her percorten shot 4 days early? We are going out of town and she will be with the dog sitter. No, giving the Percorten shot early will not hurt. Have a good trip! Hello Dr. Peterson, I am hoping you can give me a clue on where to go from here. I have a 5yr old lab/st bernard/ springer mix. He was diagnosed with Addisons in October of 2012. He is currently on .6 mg fludrocortisone 2 times daily. In may his levels were tested. Sodium 147 Potassium 4.8. However My doctor also noticed his Triglycerides were 558 and Cholesterol 447. I took him back 2 days ago July 21. Sodium 141 potassium 4.7 Triglycerides 2427 cholesterol 1561. My question is could his treatment for addisons be causing the increase in his triglycerides or is he developing another problem as well? Also where should we go with testing from here to look for why the increase? The only other thing noted on his blood work by my doctor is he is slightly anemic. He has also lost about 1 pound of weight from last check up to this one. He was fasted 12 plus hours for this blood work. The high cholesterol and triglycerides could be secondary to the fludrocortisone. The doses you are using are very high. If possible, I'd switch over to the Percorten injections given once a month. The anemia is probably not related. Talk to your vet about a plan or workup for that problem. Hello Dr. Peterson, I posted a question to you above on 5/19/15 about my 15yo dachshund Kolbe with Cushing's who developed Addison's after being on Vetoryl 30mg daily. I'm hoping you might have some more advice for me. We held the drug and gave prednisone for a bit and an ACTH test 7/10/15 showed pre-cortisol 7.8 and post 24. So, we restarted Vetoryl, but at a lower dose of 10mg daily 7/11/15; he weighs about 11 pounds. He had another ACTH test yesterday and his pre-cortisol was 2.2 and post 2.1 and this is after being on only 10mg for a little over 2 weeks. Our vet is not sure where to go with him. Any insight you could provide would be helpful. I'd continue to monitor and do another ACTH stimulation test in 3-4 weeks. Our 5yr old poodle (9 lbs) is being treated for Addison's Disease. She gets 1/2 ml Prednisone daily - and .25 of Percorten every 30 days. She has been getting bouts of bad diarrhea and occasional vomiting (although she wants to eat). I read that Prednisone causes diarrhea and to reduce the Prednisone to every other day. Is this a good idea. Do you have any suggestions to clear up the diarrhea? Thank you for your help. At 9 pounds, your dog should not need more than 1 mg of pred per day. One-half tablet is likely to be 2.5 mg. If so, I'd give every day but get the pills or liquid as 1 mg size. My 5 year old Lab was diagnosed with Addison's when she about 1.5 years old. She takes half of a 5mg dose of Prednisone daily and 2.80 of Percorten injection every 28 days. She weights 75 pounds. She has been doing very well. Last month after her DOCP injection two large and very hard lumps appeared on both sides of her loin area where she receives the shots. The vet up her prednisone for that night only to see if the lumps would go away. They did not go away. They do not appear tender to the touch. Two days ago she had her DOCP and the vet gave her the injection in her right hind leg since she has the two large lumps from last month's injection are still present. This evening I noticed she now has a sizeable lump at the injection site on her leg. Has she become allergic to DOCP? She is acting fine. The vet said they purchasing from the same manufacturer as they have been all along. Any advice you can provide is much appreciated. I've not seen this. I'd have your vet call the company (manufacturer) to see if they have an explanation. You should probably biopsy one of the lumps to see what it shows histologically... that may help determine what's going on. But in the future, I'd give the injection SQ rather than IM to see if that helps. Thank you very much for your quick reply. Would you please explain what you mean by: " I'd give the injection SQ rather than "IM." I do not know what "SQ" and "IM" means. We will have a biopsy done. Increasing the prednisone is unlikely to help. I'd recommend getting a second opinion. Something is off here - maybe the wrong diagnosis! I have two Siberian huskies. They are brother and sister and are now two years old. The male was diagnosed with Addisons in February. The female was diagnosed in June. Both have glucocorticoid deficiency only. Both are on prednisone daily and have done well. The male has started tremoring again...the last tremoring ocurred yesterday and lasted over five minutes. Should I worry or is this part of the disease. My vet said to double his prednisone and we are rechecking his mineralcorticoids. He is playful and eats well. In fact he had a voracious appetite and is always hungry. He weighed 50 pounds when diagnosed and now weighs 89 pounds despite reducing his food. He gets 3.5 mg of Prednisone daily. I'm concerned we do not have him regulated correctly or something else may be going on. Any thoughts? First of all, Addison's disease is defined as total adrenal insufficiency, not just glucocorticoid deficiency. Glucocorticoid deficiency is not very common unless induced by glucocorticoid treatment. Doubling the prednisone, especially in a dog that has gained 40 pounds on the drug, seems inappropriate to me. I would recommend s getting another opinion about the diagnosis and proper treatment, ideally with a specialist. Thank you. Unfortunately we live on a small town in Mississippi without specialty vets. Do I need to look for a board certified internal medicine vet or a doggie endocrinologist or are they the same? You might need to go to the vet school at MSU. An internist would be fine. Thank you very much for your time and dedication to our four legged family members. You are an angel on earth. I am so happy to see this post still active! We are now 2 months into treatment of our Addisonian dog. He currently takes Fludrocortisone in .6mg dosage, twice a day. (He is a 7 year old, 95 pound Mastiff bread). His diagnosis is more complicated due to a heart issue that has him on Dilacor 240mg twice a day, Enalapril 20mg twice a day and Pimobendan 10mg in the morning and 5mg in the eve - (we found 10mg again in the evening made his heart race). We had stopped his steroid a week into being on the Florinef, but his appetite is nearly non-existent now - he will only eat treats, not his regular dog food. My biggest concern right now is his muscle atrophy. His entire body went from looking very healthy to scrawny in just about a week and we noticed he can no longer jump into the car after starting his medications. His weight, however only fluctuated a pound. Is it possible his meds are causing the muscle loss? Is there an issue with mixing any of these prescriptions? My veterinarian is keeping up with him, but I would love a second opinion as this seems to be a rare disease and they are not always able to answer my questions - specifically about his muscle loss. (He is also seeing a cardiologist). He looks quite sickly, though his activity level is better than before the meds. The heart condition certainly complicates things. The muscle wasting is from not eating and probably an effect of the heart condition, not from Addison's at this point. Talk to your vet about how to increase the appetite. This should not happen if the addison's dog is regulated. But it could be unrelated to the Addison's. Talk to your vet as soon as possible so this can be worked out what do to. May or may not be an emergency, but probably not. Thanks we will take him in tomorrow! My Addisonian labrador was recently in boarding kennels where he developed very severe diarrhoea, dehydration and rapid weight loss . After many blood/stool tests his Electrolytes were stable and he tested negative for all bacteria/parasites etc. The vet advised whilst in kennels he be on prednisolone and prescribed 5mg twice daily ( when first diagnosed with addisons he was on 1mg, twice daily and then weaned off it) I queried the dosage but was told this was fine. Is there any chance the higher dosage of steroids could have caused his illness as he did improve once he'd come off them?? He has been at this kennels many times pre-addisons and never had any issues. Going from no predisone up to 10 mg per day could possible have caused a problem. Remember that the human maintenance dosage is only 5 mg per day. Now, if your dog was boarding and developed problems, we may need to start glucocorticoids, possibly even a dose that high if the stress was high enough. Our 4 y.o female Cane Corso received her meds from both mom and dad yesterday...oops! She has been stable on the same dose of meds for over 6 months. I'm guessing we should just omit today's dose and resume tomorrow, would that be okay? Are there any significant symptoms for which we should be watching? I have an 11 year old female pom-apoo weighing 8.5 lbs. She was diagnosed with Addison's Disease 5 years ago. They tried the monthly injection by discovered she was allergic to it. She now takes 1 and 1/2 tablets of 0.1 mg fludrocortisone acetate every morning and takes .3 ml of Prednisolone Syrup 15mg/5ml/#30 ml in times of distress. Lately she has been drinking excessively and urinating excessively sometimes in her sleep. Her urine is extremely diluted. Could this have anything to do with her medication? Any help would be greatly appreciate. Of course it could be the medicine. Or it could be kidney disease or a urinary tract infection, etc. Talk to your vet and have a checkup if you haven't done so within the last few weeks. Our 4 year old dog was diagnosed with Addison's on Monday. Prior to being admitted she was not eating, vomitting, direah, and shaking. She received a Docp shot on Monday. It is not Friday. She is also on 5mg of prednisone. She weighs 64 lbs. she is still very sleepy/tired/out of it. Does the docp need time to kick in? She also suffered muscle wasting in her head that my doctor said could happen from the disease. Does she need more time to rest? Your dog should be feeling much better by now. Call your vet. Thank you for responding. We made an apt for an internal medicine doctor as well as a cardiologist. A 2/6 systolic heart murmur was also documented. She is still very very tired and lethargic. My beagle mix was diagnosed with Addison's about 6 months ago. He has been doing well on 1.25mg of Prednisone daily and monthly Percorten V injection. We recently (Jan. 3rd) gave Cooper his injection but reduced it from 1.5 to 1.0. For the last few days his body has been jumping almost like hiccups. He vomited twice in the last few days-mostly water the first time and today a small amount but a thick dark fluid. Do you think this is because we reduced his Percorten V too much. He weighs approximately 86 pounds-about 10 of those pounds he gained after diagnosis due to constant hunger from the prednisone-hence the reason we are trying him on the low dose protocol. If you feel this is Addison's related, can we give him the .5 now or do we need to increase on his next dose. I want to know if we can supplement the 1.0 injection mid cycle without hurting him. Otherwise he is eating, drinking normally. Could this not be Addison's related at all? I worry he swallowed something and it's stuck making him "hiccup" like this. Thank you for your consideration. You need to see your vet and determine what's going on. I'm assuming that you have been monitoring serum electrolytes as you adjust the Percorten dose. Obviously, that must be done. Dr. Peterson, my 70 lbs doberman (was 85 lbs when healthy) was diagnosed with Addison's and was prescribed 20mg of prednisone every 24 hours for 7 days then 10mg every 24 hours after the 7 days. She is currently on her second day and even though she is eating, she still looks weak. She also urinated 3x around the house. It's the biggest puddles I've seen. She is drinking a lot more as well. She was also given 2.8ml of percorten. I feel the 20mg every 24 hour or even the 10 mg every 24 hours is way high in dosage from my brief research. Any input and what should I lower my dosages to for both percorten and prednisone? 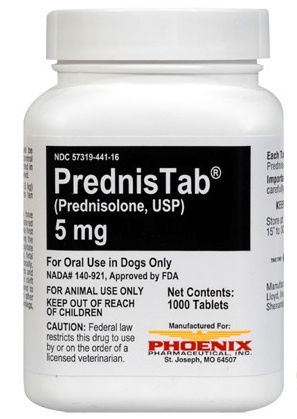 The daily maintenance dose of prednisone for dogs is 0.1-1.2 mg/kg. So your dog (35-38 kg) should get a dose of no more than 5 mg per day. My 7lb dachshund/yorkie mix was diagnosed with Addisons over two years ago. I give her Percorten injection .18ml every 25 days and she gets .1ml prednisolone every morning. We recently had to leave Annie with a sitter and came home to a sick dog. She was vomiting and had diarrhea. She was due her percorten shot the day after we picked her up and has improved since I gave her the injection. My concern is I know that the next time we must go away without Annie, she will be near the end of her shot. Should I up her Pred a bit while we are gone? Could I give her Percorten early? I would love to avoid her getting ill again. I feel bad for the sitter and for my pup? Also, is her prednisolone dose too low? It seems to work for her but should I increase it if I know she will be stressed? I have no idea what the mg-dosage of 1-ml of pred would be. . But you could increase the pred for a few day when you were gone to 0.2-0.4 mg/kg per day. Giving the percorten early isn't going to hurt but probably wouldn't help either. I have a 5year old, 23kg, female dog diagnosed with Addison's 4 weeks ago. She was in hospital for 4 days and was stabilised on prednisolone 5mg daily and Florinef 0.4mg (0.2mg twice daily). Since then we have been back twice for check up and all values normal. Today she has diarrhea and I am wondering if I should be worried and take some action? She seems otherwise fine and is active and eating well. Thank you. Diarrhea is not an emergency in an alert dog that is eating. Talk to your vet. I have a 3year old hound mix who was surrendered mid crisis to my emergency hospital. He was administered Percorten and pred and did fine. I adopted him and come time for his second injection, he had an odd reaction- body hives, low BP, Vomiting- and so we switched him to Florinef twice daily. His electrolytes and full Chem are normal. He has recently developed PUPD despite the urine having a USG of 1.040 each time so not dilute. UA revealed no infection either. And not finishing his breakfast, only breakfast though so it's hard to tell if it's behavioral or inappetitance. We were just going to give Percorten another shot but in Reading this thread should I try adding pred daily first? Well, adding in pred could make the urination worse but may improve the appetite. Talk to your vet. Thank you so much for this forum. I have a Golden Retriever/Gr Pyrenees mix (62lbs originally). she has been acting ill on and off for over a year. She was just diagnosed, based on an ultrasound. The tech said that he could find "no adrenals." The clinic only did a baseline cortisol test on her. It was less than 1. No other tests were done. She was given a Percorten injection and I was instructed to give 2.5mgs of prednisone a day. Forty-eight hours later, we were in the emergency hospital. She was in crisis mode. Her electrolytes were extreme and she collapsed in the waiting room. She was stabilized, with fluids, overnight. The vet at the hospital told me to up the prednisone to 5mg a day. That same day, I interviewed a new vet. She upped the prednisone to 10mg a day. My dog was not showing improvement, on the 10 mgs. Still tremors, dry gums and little appetite. This appeared to be gradually getting worse. That vet left for the rest of the week. She had recommended one of the other vets, at the clinic. He initially upped her prednisone to 20 mgs because she was not getting better. This seemed to work, for one day. Her appetite came back and she was more energetic. Then, today she appeared to be back to very minimal appetite, dry gums and lethargic. The vet instructed me to give an additional 10 mgs, this evening. Meaning my dog (now approximately 53 lbs) was to get 30 mgs today and tomorrow. Twenty in the morning and 10, at night. She did develop some appetite but still dry gums and little energy. The vet stated that the high dose for a few days, would not be a problem. He was aware that a high dose could cause Cushings. I see that you are recommending thyroid testing, for some dogs. Is it unusual for a dog that has been ill for a year or more to take this much medication and this long to respond? Should she be tested for something else? The ACTH stim test was never done by the 1st vet and now it would not be helpful. Thank you so much. I suspect that something has been missed. Giving that much prednisone will make any dog "look" better but we aren't treating Addison's with these high doses. Many dogs need a few days in the hospital on IV fluids - we don't normally send them home after a single overnight stay. Talk to your vet about referral to a specialist. My dog, 23kg, was diagnosed 2 months ago and has been stable on Florinef 0.4mg per day and prednisolone 5mg/day. In her recent control sodium was 134 and potassium 4.9. My vet is unsure whether to increase the dose of Florinef. I would very much value your opinion on this. If clinically well, I would not change the dose. My vet has just informed me that Florinef is no longer available. My dog was diagnosed 4 months ago and has been taking 0.2mgs twice a day. He has been so well recently I am so upset that we have to go back to the beginning. He does not tolerate prednisolone well as it seems to give him diarrhoea. What would you suggest please? I haven't heard that Florinef was discontinued but that seems unlikely (how would they treat human patients)? In any case, you should be able to get Florinef compounded without a problem. My 6yo 60lb. mixed breed pup was diagnosed with Atypical Addison's a little over a year ago. For many months he's been on 2.5mg of Prednisone twice a week (once on Tuesday, once on Friday). At this dose his Addison's seems to be in check, but suffers from PU on the day he gets is med and less severely the day after his med. In the past we've reduced his dose to a 1/4 tab (1.25mg) on Tuesday and 2.5mg on Friday. Even at this dose he suffered from PU. However, we also noticed excessive shedding at this dose. Not knowing any better at the time, we thought the hair loss was from the Addison's so we upped his dose back up to 2.5mg twice a week and the shedding subsided. When we mentioned this to our vet she said something along the lines of, "hmm, that's interesting", but provided no follow up (we are now searching for a new vet). Based on what I've read here it's sounding like my guy might be suffering from hyperthyroidism. Would you agree a thyroid test is in order? As for the Prednisone dosage, due to the PU it would seem an even smaller dose is in order. Is it possible that a dog with Atypical Addison's could need only 2.5 or 1mg of Prednisone a week? To date we've taken the approach of I'd rather error on the side of too much for fear of him experiencing another Addisonian crisis. I should also add that he is on 35mg of Fluoxetine daily for anxiety. I guess hyperthyroidism is a possibility but it's rare and caused by thyroid carcinoma. There is no link between hyperthyroidism and Addison's. With pred only being given twice a week, I question the diagnosis anyway. I'd find an endocrinologist or internal medicine specialist and reevaluate the original diagnosis. My 50lb lab mix was diagnosed with atypical addisons about 2 years ago. She is currently taking 0.2mg of fludrocortisone acetate along with 2.5mg of prednisone 2x a day. I was recently doing research on atypical addisons treatment again and noticed most sources saying she does not need both. I contacted my vet and the emergency clinic that diagnosed her to confirm if I misheard the results or if she has possibly been taking the fludro when she might not need it, but the internist who diagnosed her is out until Friday. Since she is doing okay I told them I could wait to confirm with him, but I am wondering if somehow she does have atypical and has been unnecessarily taking fludro, would this have impacted her bloodwork where they would have caught it meaning she actually might have typical addisons instead or could she be at risk for having any adverse side effects? Regardless of the results, I am happy as long as she is healthy, but I am worried what this could mean if she was taking something she did not need for so long. Any ideas? Dogs with "atypical" Addison's either have primary hypoadrenocorticism and need Florinef or have secondary hypoadrenocorticism (Pituitary ACTH deficiency) and don't need it. What the term "atypical" means to me is that the vet didn't do the complete workup to determine what the real cause or etiology is (it's not a definitive diagnosis). Right now, it's going to be difficult to do the workup, so I'd continue doing what you are doing since your dog is well. My 9 year-old Shih Tzu had high liver enzymes a year ago. After much testing including ultrasounds it was determined that she had a tumor on her right adrenalin gland. She had the surgery to remove the benign adenoma and biopsy that was also done on her liver showed no problems. She did very well by last Nov once again her liver enzymes starting becoming extremely high and her calcium level was also getting high. At first she showed no other symptoms but then stopped eating well. She went to an internal medicine specialist who ran more tests. ACTH panel showed elevated cortisol, progesterone and androstenedione. An abdominal ultrasound showed a nodule on left adrenal, with high calcium and ultrasound was done on parathyroids. Two appeared abnormal. The specialist recommended surgery to biopsy and/or remove parathyroids as necessary, liver biopsy, and remove remaining adrenalin. After much discussion with our regular vet, internist and surgeon, Samantha had the surgery. All pathology reports showed no malignancies and liver just appeared to be responding to her hyperadrenocortism. She was given the DOCP by the surgeo and is on 1 mg prednisone every day. She had an issue 3 days after surgery with hypocalcemia, had to remain in emergency care getting injections for the calcium. She was finally able to go with calcitriol and has been home over a week. She is also getting levothyroxine once a day becomes her thyroid is not fully functioning right now. Blood work was done on Friday and all was good so we were told to keep her on everything for now. She has been doing great since she came home up until today. Today is a holiday and I will call the surgeon in the morning but concerned that her appetite is suddenly off, and acting more like she did before the surgery. Even though her levels were fine three days ago could the remaining parathyroids be functioning now and she is making too much calcium. Also we were told DOCP every 25 days but could she need it sooner; today is 20 days since the shot. I will be asking all of these questions to her vets but would really appreciate your input. I am worried we put her through all of this and will still lose her. It's very unlikely that you are going to lose your dog anytime soon. Talk to your vet(s) first thing in the morning and be ready to take her in for another examine, etc. First of all, thank you for creating this blog and sharing your expertise publicly. My 4 yr old Collie mix was diagnosed with Addisons this winter. He has had 4 Percorten shots over as many months and is on 2.5mg of Prednisone each day. He is currently about 61 pounds, though before the diagnosis, he was only 50lbs. His lab numbers are "good" according to our vet and he, for the most part, is back to normal. However, he definitely acts as if he feels bad about 5 days before he is due for his shot, which is administered every 25 days and is still at the highest recommended dose for his size. Some of his symptoms are strange. Besides more lethargy and that overall look that he just doesn't feel great, he alternates between constipation (for about 3 days) followed by a day of loose stool, though not diarrhea. Also, the fur on his throat, which is typically white, becomes grey. A couple days after his shot, this decreases. It is not dirt. His fur, all the way down to the skin, turns sooty grey. And he barely sheds. I'm not complaining about this. Collies shed a lot normally. He sheds almost nothing now. Whereas before he would shed handfuls, now it is 2-3 hairs when he is petted. He does not seem to know when he needs to go to the bathroom. He does not ask to go out like he did before, so we take him out every 2-3 hours and he urinates quite a lot. However, his extreme thirst has subsided since we lowered the Pred. He also, occasionally, dribbles urine in his sleep. This usually happens after his morning trip outside. It's as if he is not emptying his bladder fully, then leaks later. If we take him for a walk in the morning, allowing him to pee on bushes and trees, the leaking does not occur later when he naps. He also (particularly the closer to the 25 day mark) has strange eye issues. I can only describe it like this: his eyes seem to sink back into his skull when he chews, especially crunchy things. We first noticed it the weekend before he was diagnosed. It got better after treatment started, but comes back subtlely as we go through the month and is extreme (disturbingly so) by about day 23. So, my question is this: should we administer his shot on a different schedule? Perhaps every 21 days? Increase or decrease the Pred? Yes, I'd try giving the Percorten at 21 days. If the urination (increased) continues over the next month or two, you can try lowering the prednisione to 2.5 mg every other day or 1.25 mg every day. She was been fine on a 28 day cycle and has had 3 injections in total reducing from initial dose of 2.2mg/kg to 1.7mg/kg and may reduce further dependent on her Day 27 lytes at the end of this cycle. Next step obviously ultrasound but I was wondering - Is there a chance she is reacting to the Percoten itself? I've never seen this with Percoten, I'd go ahead and do the abdominal ultrasound. Greetings Dr Peterson, We have an Addison’s dog diagnosed 9 months ago. Up until recently, all has been good 2.5mg preds and percorten V every month. A month and a half ago his platelets dropped and have remained low, but he is completely asymptomatic (no bleeding or bruising etc,) all other CBC values are good. Our vet said this could be a possible side effect from the percorten V. I have contacted Dr Jean Dodds who has been truly helpful, said that the platelet drop could be from thyroid problems that can occur in Addison dogs. Can platelets be affected by percorten V and would you recommend a full thyroid test. Percorten does not cause thrombocytopenia. I don't really think hypothyroidism does either but it's always a good idea to rule it out. Many dogs with develop both problems. I'd have a hematologist carefully review the platelet numbers on slide review. Based on clinical response. If your vet doesn't know this, I'd recommend you get another opinion! My dog was diagnosed this week with atypical Addison's after a three-day stay at the Vet where she received IV fluids and her electrolytes registered 0.2. We started her on 7.5 mg of prednisone 2x/day yesterday. She once again seems lethargic and now I'm very concerned about her initially dosing of prednisone after reading info online. Is this an appropriate dosage and should her renewed lethargy be a concern? Thank you. That's a huge dose, even for a human patient. I'd get another opinion, ideally with an internal medicine specialist. Thank you Dr. H. I'm going to cut it back to 7.5 mg/day until I can get another opinion. I have an a have an Addison’s dog diagnosed 2 years ago. Up until recently, all has been good she's on florinef 0.3g twice a day and prednisolone 5mg once a day. She's a border collie 5 years old, 25kg. Everything was well till last week when she start making poo at home with blood and pee. Also she is drinking much more. Her apetite is fine I would even say she's more hungry then ever. Also would like to mention she's an epileptic dog and she is taking epiphen 30 mg and 60 mg twice daily, and libromide 325mg in the morning and 1 and a half tablet every evening. Do you thing I should increase dosage of florinef? Or maybe stop using prednisolone? I am living in a small town and my vet is not very experience with addison disease. I'd recommend that you first rule out other problems. The dosages should not change after 2 years. This has been a very informative thread. Thanks! My 15 lb chihuahua mix has had addisons for about 2.5 years now and she's well maintained on 15mg of Percorten every 30-35 days and .5 mg prednisone/day. She's started showing some symptoms of being ready for her next shot (her appetite has decreased and she's acting a little strange), but we are only 19 days into the cycle. It's been particularly hot for the past 3 weeks (and our house has no AC - not usually necessary in the pacific NW.) Could she be processing the Percorten faster than usual because of the heat? I am happy to give her her injection early, but if my hypothesis is totally off I'll bring her in for a checkup. Definitely, bring your dog in for a checkup. Can not hurt to give the shot too early. Our 64 lb 7 1/2 year old boxer was just disgnoised with Addisins and has received his first shot and on 10mg pred. A day. He just had more blood work to see if electrolytes changed etc and they were good. Doc said to reduce pred to 5 mg. he also has low thyroid and is on meds for that. Is it ok to give him both meds in the morning at same time? Also. Doing another urine culture because he had over abundance of bacteria and high urine concentration. So waiting for culture to be finished on this. Also going on vacation and he will be boarded 10 days , which is stressful anyways for him. Doc said to up his pred the day before and while being boarded to 20mg. Just wondering about this. Also is there a protocol for reduction back down to normal 5 mg after ? Just a little worried about the boarding. I'd give the thyroid and pred at least an hour apart if possible. Thyroid is best given on an empty stomach. The pred maintenance dose for your dog is between 2.5-5.0 mg per day. If he is boarding, I may double that dosage but no higher, and if he is eating I would not increase it at all. Do you really want his cage to be flooded with pee from urinating so much? My dog was diagnosed with Addison's earlier this year. She is well maintained on Florinef 0.25mg twice daily and prednisolone 3.75mg daily (she weighs 24kg). Today she had had diarrhea a few times and the last couple of times it contains red blood and some mucus. This morning I gave her an additional 3.75mg prednisiolone. She seems otherwise well and her appetite is Ok. I have changed her food to rice and chicken in small portions. Do you think I need to take any other action at this time? No, don't do anything else at this time. Call your vet tomorrow if still not well. Hello Dr. Peterson. May I start by saying thank you very much for making yourself available for questions. My 15 year old Westie with Pulmonary Fibrosis who takes daily inhaled Steroid treatment, was diagnosed with Addison's on 8/24 via an ACTH stim test in which both Cortisol samples were <1.0. The day of her Stim test her Lytes were NA 140, and K 5.7 She was started on daily Prednisolone. A couple of weeks later she was exhibiting intermittant hind end weekness tho eating well with normal stool. Concerned that she might be transitioning from Atypical to Typical, I took her in for a follow up Lytes test. An in house panel gave results of NA 160, and K 6.0. My vet said that she now needed mineralcorticosteroid treatment, and she was given an injection of Percorten V at the manufacturers recommended dose. On the same day her BUN was elevated at 111 and Cre 1.5. Not surprising.. I wouldn't expect a potassium level of 6.0 to cause any major signs such as not eating. talk to your vet and look for something else. Hi Dr. Peterson, my 5 year old Australian kelpie cross was diagnosed with addisons 1 yr ago. She is on pred and her dosage seems to be working well. However, she seems like she is ALWAYS hungry. I cannot feed her enough and she is getting 3 cups a day per the recommended amount... Plus some added amounts when she gives me those puppy dog eyes....I know that is terrible of me but she has started eating loaves of bread off of my counter which totally not normal for her. We have not changed her diet for 1 year and she will not eat any vegetables but cooked potatoes. She used to be very fit but is quickly putting on the weight. Is there anything I can do to manage this better? Thank you very much for your time. Polyphagia is a common sign of pred overdosage. Talk to your vet about trying to decrease the dose. Hi Dr. Peterson... I apologize. I am still a feeling confused after reading your reply to my post of Sept. 13. May I please ask: In a dog initially diagnosed with Atypical Addison's, what medical symptoms and/or lab work results would cause you to initiate teatment with Percorten V if the dog were not in crisis? And second, once the dog is on Percorten V... what is the goal for their lab values when re-testing their Electrolytes? My point was that your dog might need the Percorten (based on the high potassium(, but that's not what's causing the anorexia. It's not due to a potassium level of 6. Talk to your vet or get another opinion. Hello Dr. Peterson. We got the diagnosis today on our 2.5 year old GSD. He had a crash 2 weeks ago and we tested for a couple other things we were suspicious of all came back negative. His Na+ K+ levels are perfect. He came back a little low of thyroid levels which is odd because he is a rail. But besides that perfect blood work, so we're saying atypical. Well he had ACTH yesterday and hates the vet so he was super stressed he started having a little episode so I called the vet said to give 60mg pred today and tomorrow then Monday morning bring it to give an injection. I was just told its one he will have to have every 25 days so I'm assuming DOCP. I don't want to sound like a know it all to him because he has always been fantastic but atypical is normally treated with just prednisone correct? I don't want to have to do the injections if we can avoid them because he is a handful at the office. Thank you! No, Percorten isn't needed if the serum electrolytes are normal. 60 mg of pred is a huge dose (about 12-times the human maintenance dose), much higher than I would use. I'm would not be so sure that this is all due to atypical Addison's.. if things don't go perfectly, you should get another opinion (ideally with a specialist). He is doing great today, I only had pred on hand no dex. He seen an internal medicine dr to check for insulinoma and he is consulting with our normal vet. I have contacted you several times this year since my dog was diagnosed with Addison's and on each occasion have been grateful for your advice and reassurance. I thank you sincerely. Until recently my dog, 23kg, has been maintained on Florinef 0.5mg daily (0.25mg twice daily) and prednisolone 3.75mg daily. About a month ago we reduced the prednisiolone to 2.5mg daily because she had hair loss round her neck. She has been clinically well since. A routine blood sample was taken last week to check sodium and potassium but they had problems running the sample due to 'fat/lipids' (not further specified) in the blood. A fasting sample was taken but the problem remained. A specialist laboratory successfully ran the sample: sodium 140mmol/L and potassium 5.3mmol/L, ratio 26.4. In addition they checked for hypothyroidism by measuring T4 and TSH which were normal. I am somewhat concerned about the high 'fat/lipids' in the blood and what causes this. I be grateful for your comments on whether further testing or investigations would be useful? And do you think the high potassium is a problem (we plan to have this checked again in 3 months time)? Once again, thank you. We see hyperlipidemia in some dogs treated with Florinef. Since dogs do not develop cardiovascular disease, it's not a big cause for concern. You can switch to DOCP injections if it continues. I would not worry about a K of 5.3 if your dog is acting well. No, I've not seen head shaking in Addison's. My 11 year old dog was diagnosed back in 2012 with Addison's. Her electrolytes are well under control with .5ml percorten, but I am having trouble with her prednisone dosage. For 3 years she was doing well on alternating days of .5mg and 1mg, but began having episodes of vomiting/diarrhea and was upped to 1mg daily and then was again doing well. Now a about 3 months ago she became very lethargic one night and in a panic I gave her 1mg pred without food. She improved over the next couple days, but had several black tarry stools that I thought was caused by getting pred on an empty stomach. Her vet disagreed and said the GI bleed was more likely from her not getting enough pred and upped her dose to 2mg daily. I'm thinking she needs to lower her pred, but her vet likes doing cortisol tests (which I'm reading on your blog are useless) and says we shouldn't lower pred, but should go on Denamarin. -Could the GI bleed indeed have been caused by me stupidly giving pred on an empty stomach? -How much should I increase her dose on stressful days? If it's an unexpected stress or she begins exhibiting symptoms, is it ok to give extra after the fact as long as with food? -If I slowly reduce the 2mg pred, should her liver numbers normalize? -What dosage of pred should I aim for in a 40 lb dog (obviously also taking into account how she's acting)? -How long should I wait after reaching the desired dosage to retest liver labs? -Since my vet is still looking at cortisol levels, do you know any vets experienced with Addison's in the Chicagoland area? That was a lot of questions, but I was so excited to find your blog! Thank you in advance for your help. It is greatly appreciated! Many dogs with Addison's do fairly well even without any prednisone. In your dog, I'd give a dose of 2 mg per day. I don't think that the GI bleed has anything to do with the pred or Addison's. We don't see GI bleeding 4 years after diagnosis. I'd get another opinion with a gastroenterologist or good internal medicine specialist. Call the ACVIM to find a specialist. Thank you Dr. Peterson for your response, but could you please clarify why I would keep her on 2mg pred daily. If I slowly lowered the dose, shouldn't her liver numbers normalize along with the panting and weight gain? Or you think the increased pred isn't causing this either? I really doubt that 2 mg would lead to increased ALT in a 40 pound dog. And I thought you were all worried about a GI bleed? Talk to your vet please. You are correct -- that's a very high dose of pred. What about mineralocorticoid supplementation? Addison's typically develops in young middle aged dogs...I don't think any dogs have been reported older than 12 years or so. I'd strongly recommend that you find another vet (internal medicine specialist) and get another opinion. Percorten is very safe so don't worry if the serum electrolytes are normal at times. They do not have to abnormal to give the injection. Greetings Dr Peterson. I would like to thank you for your blog that has been such a blessing for all of us seeking some advise from somebody of your stature . Thank you. I apologize if this message comes through twice as I have had internet problems and was not sure if it went through. I have a couple of questions I would really appreciate your input on. My dog who weighs 45 Kg was diagnosed with Addison's about a year ago. He receives his monthly percorten V injection and is on a maintenance dose of 2.5mg daily of preds. He has been stable and happy up until about five days ago. We have been experiencing severe intermittent thunderstorms on a daily basis and he is very storm phobic. He does not eat when it storms and will only eat after he feels the storm is over. This time around due to the duration of the storms he has been very reluctant to eat and seems to be in an anticipatory anxiety state waiting for the next storm even if it has cleared. We have consulted with two of our Vets with conflicting instructions. The internal medicine specialist says we should raise his preds for 4 days from 2.5 to 20mg(He is very pred intolerant) and his family vet says this is way too much and the preds should be double to 5 mg half morning half night. Furthermore our dogs behavior at present is as if he is anxious and needs some coaxing in order to eat but then eats. My questions are : Is his behavior due to perhaps low cortisol levels or environmental factors or both.Would a dogs behavior return to normal if preds are increased. And finally what pred dose would you recommend. First of all, I'd find another specialist... 20 mg is 4 times the human maintenance dose, which is ridiculous. I doubt if the increased pred dose would help anyway, but the only way to know is to increase the dose (I'd double to 5 mg as your vet said) and see the response. My Babie was just diagnosed with Addison's disease. Today was her first injection of percorten v. How long will it take to see an improvement in her appetite and water intake and the tremors? Is there anything else I can do to help her? Hi Dr Peterson, You have a very helpful blog and I have found your comments to be very informative. I have a dog with Hypoadrenocorticism and have followed and read through many of your comments. Following on from the previous question you have responded to, I am curious to know as to whether in times of stress as seems to be the case with the previous persons question, is it standard protocol to automatically increase the glucocorticoid suspecting increased stress?What would the tell tell signs be as to when it is time to increase the meds? Depends. Generally, we hospitalize the dogs until they are stable and eating. Talk to your vet. Dear Dr Peterson My 23kg girl Skye, diagnosed with PA January this year has been on prednisolone 2.5mg and Florinef 0.6mg (I recently increased from 0.5 to 0.6 on October 23). Her electrolytes have been checked on 10 occasions and Na is always low/borderline. She has had mild diarrhea/diarrhea with fresh blood on a few occasions. On October 10th she had fairly bad bloody diarrhea Na 132, K 4.6, ration 28.7. The diarrhea was treated with 10mg prednisolone daily for a week and thereafter I reduced the dose back to 2.5 over about a week. October 26th she again had diarrhea with blood. Na 138, K 4.0, ratio 34.5. Prednisolone 10mg daily for one week was again prescribed with gradual dose reduction over several weeks (I think the vet considered I had reduced too quickly on the previous occasion) plus the vet wanted me to reduce the Florinef to 0.5mg. As it happened the diarrhea stopped the same day so I never increased the prednisolone (or reduced the Florinef). My questions are 1. Could the diarrhea be due to inadequate control of the electrolytes? And if so, should the Florinef be increased? 2. Skye has loss of coat and also recently changes to lymphocytes 0.73 (1.05-5.1), ALAT 124 (9-96). Does this mean she is getting too much glucocorticoid If so, should the prednisolone dose be reduced? Skye had some bloody diarrhea again yesterday and I am not sure how to handle this but don’t really want to give her prednisolone 10mg for a week. I would very much appreciate your comments. I doubt if the diarrhea has anything to do with Addison's at this point. I'd see a gastroenterologist and have a GI workup. 2.5 mg maintenance dose of prednisolone and his monthly percorten injection. He has been very stable on this protocol. As of our last visit to our vet for his monthly injection, we were informed that in our country, prednisolone has been discontinued and have been given Medrol 4mg tabs instead.Our vet said that it is exactly the same for treating Addison's. My question is would our dosing be the same as we had it on the prednisolone? Secondly is there any risk of complications by suddenly shifting from prednisolone to Medrol and are there any other risks associated with the change? Your input would be greatly appreciated. It's close to the same drug, but not the same. Ask your vet for prednisone instead. That drug is a precursor to prednisolone and would be a better option in your dog. Hi there! I just recently adopted a 1.5 year old Swiss mountain dog with addisons, he's 125lbs and on 0.6mg of Florinef 2x a day. I noticed a couple people on here giving their dogs prednisone on high stress days or everyday. He doesn't get any. Is this normal? Or should I have some on hand just incase, and in what instances should he be getting it? He seems to pee/drink a lot, could this be from the stress of the move? He didn't eat much the first couple of days but is eating a normal amount now, no vomiting, or shakiness. Florinef has a lot of glucocorticoid activity, so he probably doesn't need additional prednisone. I'd only use it when needed. My puppy was just diagnosed with Addison's disease. He received 17 mg of DOCP on 12/26 and was put on 5mg prednisone a day. He was fine until we went on vacation and stay with a pet sitter. Wondering if the 5 mg is too high. Vet hospital said to follow up with normal vet in 3 weeks. He just doesn't seem to be the same as he was prior to the ordeal. I don't believe in over medicating. He is eating normally but drinking a lot of water. Is 3 weeks too long to wait? Will the Prednisone be tapered down? Call your vet and ask. depends on the weight and type of Addison's etc. But it sounds like the pred dose should be tapered down. That is probably causing the increased thirst. I have a 9 year old Chihuahua who was DX with Addison's at 6mo. She recently stopped active normal. She was admitted to a veterinarian hospital on IV fluids. But now they are telling me she is anemic but unsure the cause. Her laboratory values show slight anemia, but her values were increasing with fluids. I ask how do you treat anemia with the response that they need to know what caused it. I'm weary about all the testing with all the testing they already did, with no answer about how to treat anemia. She's been on percorten-v since 6mo and Prednisone at 0.3ml daily since then as well. Any recommendations would be appreciated. They've contacted an Internal medicine physician who states she shouldn't still be anemic. Addison's commonly leads to anemia, but it should resolve once the treatment is started. Dear Dr Peterson My dog, Skye, 23kg has been stable on Florinef 0.6mg/day and hydrocortisone 5mg. She recently damaged a nail which was removed under sedation and local anesthetic. Post-surgery she was prescribed prednisolone 40mg/day for 6 days, then 20mg/day for 6 days and then 10 mg/day for 6 days and then stopping. What would you normally advise following a minor surgical procedure? Absolutely not. As long as your dog is eating and feeling well, no additional pred should be needed. This blog is written for owners of pets with endocrine disorders, as well as for veterinarians and veterinary staff. For more in-depth discussions of the science behind endocrinology, please read my blog written for veterinarians: Insights into Veterinary Endocrinology. The only Animal Clinic in the world devoted exclusively to diagnosis and treatment of dogs and cats with endocrine (hormonal) problems. 3) Nuclear Imaging for Animals, in which radioisotopes are used for thyroid, liver, kidney or bone imaging (scanning).